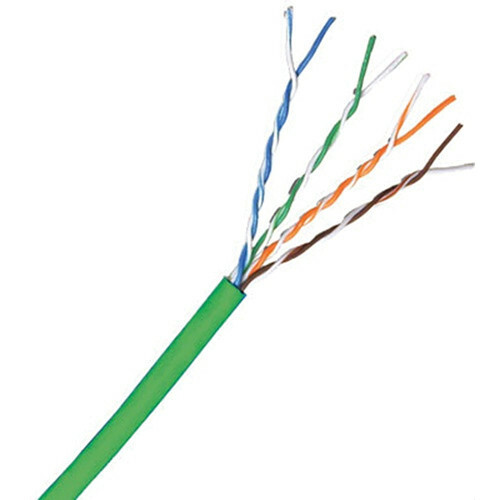 The 1000', Green Cat 6 500 MHz UTP Stranded Cable (Green) from Comprehensive is a local area network cable that has 4 unshielded twisted pairs and is made of stranded bare copper 24 AWG construction. It has a nominal outside diameter of 0.25" (6.35mm). The cable features a UL/NEC rating of CMR/MPR. It meets all the requirements as set forth in the Telecommunication Industry Association's standard 568 and 570 recommendations. Box Dimensions (LxWxH) 15.2 x 15.0 x 8.5"